Four main grooves enhances water dispersion to elevate stability and handling against hydroplaning. 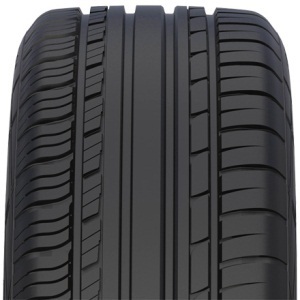 Center rib directs on-centered momentum, provides comfort,and decreases tire wear. Large ultra rigid blocks enhance on-road surface contact, deliver outstanding dry grip, and promote steering accuracy. The fine-sliced blocks effectively lower noise level during on-road contact and increase riding comfort. By appropriately crisscrossing patterns, it decreases noise level that is resulted by overlapping patterns. Equipped with interconnected blocks between tire shoulder and blocks, thusprovide a more blanced rigidity; at the same time, less noise, better comfortand overall safety have been enhanced. Uneven wear can also be efficiently controlled with such design.